Through the magic of eBay, I now have the "Wanderbuch" of Philipp Ludwig Hartmann, born April 7, 1808, who immigrated from Hesse to the United States in 1837. My interest in this item comes from some research I have been doing on a group of Germans from Hesse who traveled together to Arkansas in 1833 for the purpose, at least initially, of setting up a colony in the territory. From all evidence, this group, the Mainzner or Rheinhessen Emigration Society, was an exploratory colony for the Giessnerauswanderungsgesellschalt (Giessen Emigration Society) that was planning a larger colony to escape political repression in Hesse and to create a German-speaking state in the United States. The bad experiences of the Mainzner colonists in Arkansas resulted in the larger group deciding to bypass Arkansas and settle instead in Missouri. I am sure than some of the 140 or so immigrants from Hesse who traveled from Bremen to New Orleans, then took steamboats up the Mississippi and the Arkansas Rivers to Little Rock, arriving in May 1833, had such a Wanderbuch in their luggage. "Wanderbuch" can be translated directly as "travel book," but such a translation does not adequately capture its meaning. A "Wanderer" is not simply a traveler (Reisender), but a specific type of traveler, generally someone traveling from place to place. The difference between a Wanderer and Reisender in German is very similar to the difference in English between a wanderer and a traveler. The Wanderbuch contains the provisions of the 1810 governmental edict that ordered its creation and specified, in detail, what it was to contain. According to this edict, the Wanderbuch was created because some traveling craftsmen were misrepresenting their training, experience, and expertise, thus defrauding the people buying their services. To avoid that, the Wanderbuch was required to officially document the training a craftsman received (for example, with whom he serves an apprenticeship, where he worked as a journeyman, and how long he worked in different places). This information was to be entered and certified with a signature and seal by local officials in each place the person earned a credential. Nase (nose): strong and ?? The seal of the Grand Duchy of Hesse is at the top of the page. Another stamp, as required by the edict, specifies the type of paper in the Wanderbuch (and its cost, 40 Kronen). As required, it has 64 pages. Of course, a detailed description of the individual named in the Wanderbuch was necessary because photographs were not available at the time. 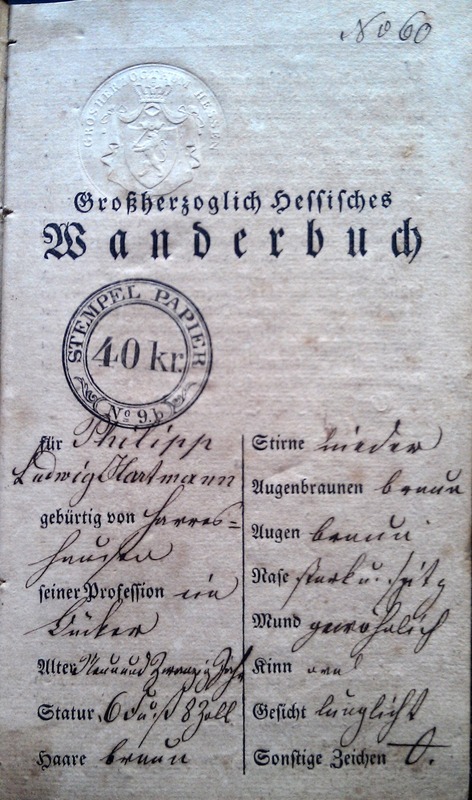 Thus, when a local official was presented with a Wanderbuch, he had to check the descriptive items to make sure that the person presenting the document was the person whose name appeared on it. In the Wanderbuch, the law mandating the Wanderbuch follows the personal information on the first page; after that, all of the pages have room for entries describing the training and experience of the person. Page 5 of Philipp Hartmann's Wanderbuch has a full page of writing. 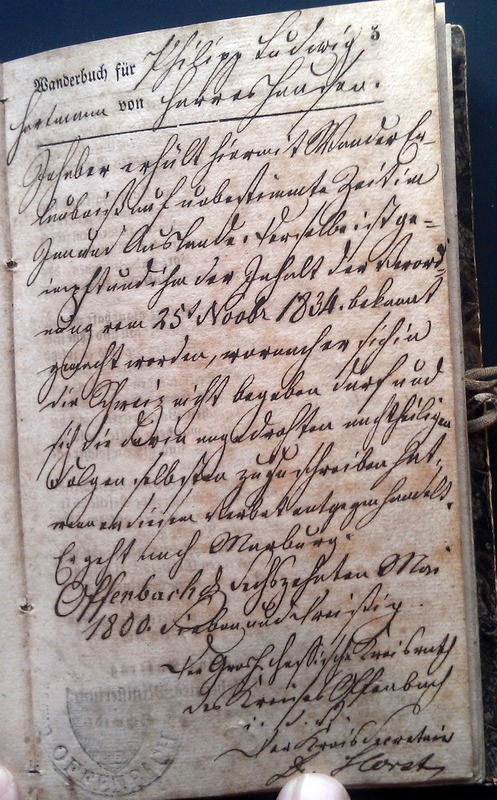 I cannot read most of this German script, but I recognize a date 23 November 1834, and the names the city of Marburg and the city or district of Offenbach, followed by a date May 1800, twenty-seven. My guess is that this page certifies the completion of an apprenticeship or some other type of training by Hartmann on November 25, 1834, and it is signed by the "Master" or the person providing the apprenticeship or training, who received his certification in May 1800. This page has the official stamp of the city (or district) of Offenbach. Two other pages in the Wanderbuch document stays by Hartman in a couple of cities. The last entry in Germany is in Bremen, dated July 7, 1837, noting that Hartmann was traveling to Baltimore. Records available on Ancestry.com show that Hartmann arrived in Baltimore on October 19, 1837. He traveled from Bremen to Baltimore on the Gustav. According to the arrival records, Hartmann was a tailor. After skipping a few pages, Hartmann wrote a few things in the Wanderbuch about his life. He wrote that he was born on April 7, 1808 in Darmstadt, a city in Hesse. He married Maria Volberh (Volberg? ), who was born in Philadelphia on May 22, 1820. They were married in Philadephia on January 17, 1839. He also mentions the birth of two sons and a daughter. His last entry noted the birth of a daughter on December 21, 1845. I was unable to find out more about him, but some documents indicate that he and his wife lived in Baltimore. As far as I know, no one has found a copy of the Wanderbuch of any of the people who traveled to Arkansas in May 1833. If one were found, it would provide some fascinating information and would be a great historical artifact. I'll keep looking for one on eBay. Thanks for doing this. I persuaded by aunt to make a copy of one of these owned by my great-great grandfather. And not a moment too soon. She was a lively woman in her 90's, but she died a few years later at 97. She didn't think the internal passport was meaningful. I told her to humor me and copy it. Although she didn't do the cover or some of the pages, I got the gist that this was similar to the one you show here. He was a Prussian traveling around the region we'd called East Germany and Poland today (Berlin, Magdeburg, Brandenburg, Gdansk, etc.) He emigrated to the US after this period of his life. I think I'll have a better time reconstructing his past with the info you have posted here. There are many stamps in his book, but also the image of a target which he used to show what kind of shot he was, and also something indicating a wardrobe. I began to wonder if he traveled for the military. I need to have the book translated. The original has disappeared, although it may be with one of my cousins. Thanks again. I'll one day piece the story together out of the fragments I have. Fun, isn't it? Thank you for your comment. It's great that you have an ancestor's Wanderbuch; you can add much to your family history with it. I enjoyed, first, learning what a Wanderbuch is, then trying to make sense of the one that I acquired. The biggest obstacle for me was trying to read handwritten German. That is a real challenge. Good luck is piecing it all together! I know it has been quite some time since you published this blog so I hope you are able to receive this comment. Recently after my mother passed away I found a Wanderbuch among her belongings. Unfortunately I am unable to translate it but the book is dated from 1823 to 1849 with every page full of stamps and writing. Do you have any recommendations on how I could get it translated? I'm not even sure whose it is. Sorry to take so long to reply to your comment. I hope that the Wanderbuch is that of a relative. It could tell you much about the history of your family. For folks like me who are not native speaker, reading German handwriting -- especially the early style of hand writing taught in schools -- is extremely difficult. So, your best bet would be to find an older native speaker of German who might be able to easily make out the handwriting. If you email me a picture of the page what has the name and description of the characteristics of the Wanderbuch owner, I will be glad to try to translate that (dan.birchbay@gmail.com). If you look closely at the stamps on each page -- which acknowledges that the person worked there -- it is sometimes easy to make out the names of the cities where he worked. Good luck.